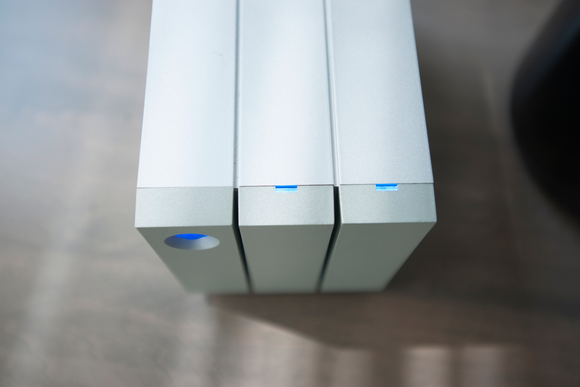 The 2big Thunderbolt 2 from LaCie. 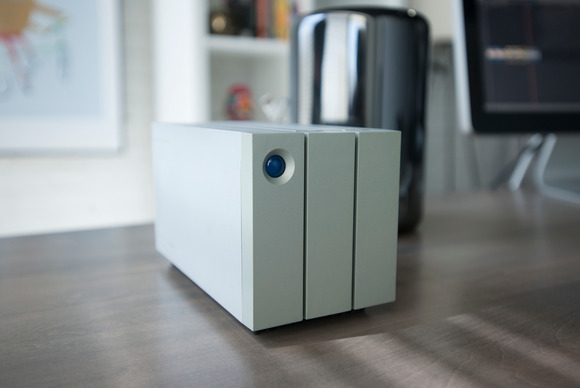 LaCie updated many of its desktop drives to include the new Thunderbolt 2 specification, and while some of the drives retained the same external design, the 2big Thunderbolt 2 has quite a different look than before. It also features hardware RAID, a handy USB 3.0 port for increased versatility, and a hidden compartment that conceals the ports and RAID selector. You can see the status lights for the individual drives peaking out the top of the drive caddy. The new chassis is 1.6-inches shorter, 0.8-inches wider, and 0.7-inches deeper than the previous generation. The glowing blue "eye" remains, albeit smaller, and functions as a power button for the drive, as well as a drive status indicator. When connected via Thunderbolt, a short press of the blue power button puts the drive in standby mode; via USB 3, a short press puts the drive in power-saving mode. A long press of the power button shuts down the drive. When your RAID fails or you remove a drive without warning, the blue eye on the front of the drive turns a warning red. Swappable drive bays now load in front of the device instead of the rear, sliding on caddies that also serve as two-thirds of the drive's front face. At the top of each drive caddy is a small cutout for each drive's status light to shine through. You can easily remove the caddies from the drive by pulling down from the top of them, however, removing the physical drives from their respective caddies will void your warranty. 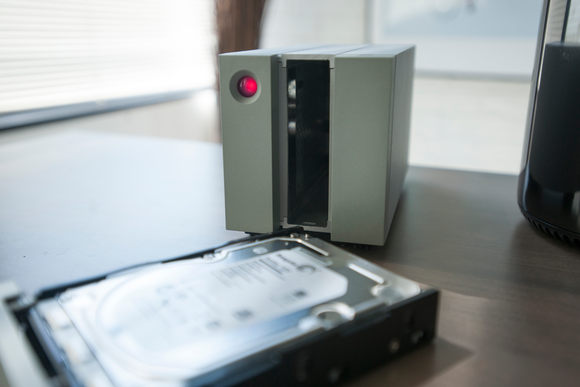 Unfortunately, to preserve your warranty, you must buy spare drives from LaCie that come pre-attached to the caddies. 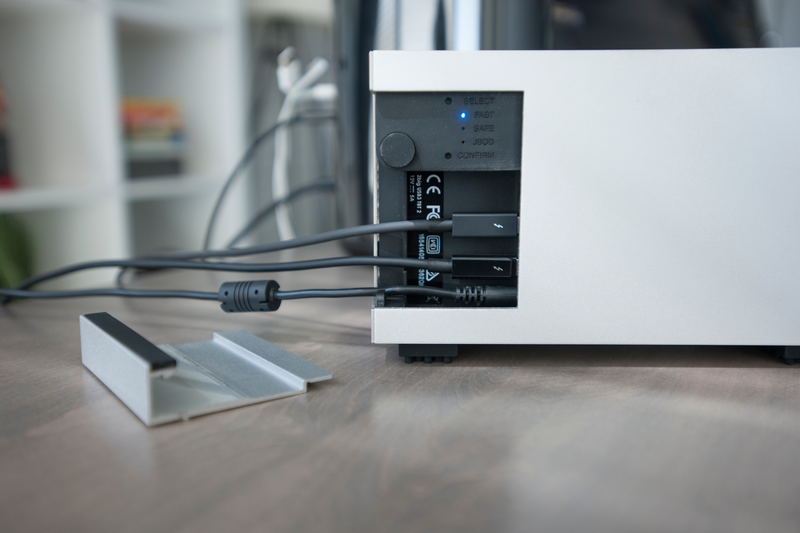 The 2big Thunderbolt 2 is kept cool by a temperature-regulated fan mounted in the rear of the drive. The bottom of the drive has some interestingly-shaped rubber feet that keep the drive from sliding on a smooth surface and help minimize vibrations. A removable aluminum panel at the back left corner of the 2big Thunderbolt 2 covers up all the ports (a pair of Thunderbolt 2 ports, USB 3.0, and power) as well as the RAID controls. It may take some force to get the side panel open or closed, especially with all the cables hooked up. To remove the aluminum panel, you push it in and towards the rear of the drive. Then you can connect the power cord and the Thunderbolt or USB cable before replacing the aluminum panel that also helps to grip and secure the cables in place, preventing accidental disconnects. Positioning the cables inside the compartment can be tricky and I needed to exert some force to get the panel open and closed. After opening and closing the compartment several times during testing, I left the cover off. You can see the RAID selector and ports with the side cover removed. Setting up the hardware RAID isn't very difficult. The drive comes pre-formatted as a fast (RAID 0) for the best performance and storage capacity. However you can also choose safe (RAID 1), or JBOD (Just a Bunch Of Disks) using the RAID selection buttons located in the hidden compartment. In our real world tests, the 2big Thunderbolt 2 marginally outperformed its predecessor when it came to writing, but reading from the drive was largely the same. AJA System Test showed more improvement, especially when reading from the new drive. To take advantage of faster Thunderbolt 2 bandwidth, you need more than two mechanical drives. Having Thunderbolt 2, however, lets you daisy chain other Thunderbolt 2 devices. Reading and writing to and from the 2big was consistently slower when using USB 3.0 as compared to Thunderbolt 2, even with just two drives. Still, it’s nice to have both interfaces, especially considering the ubiquity of USB 3.0. The addition of a hardware RAID is nice, and the drive feels much less top heavy than before. I’m not a huge fan of the removable panel in the rear, but if you don’t need to fiddle with the ports very often, it shouldn't affect your purchasing decision. Since the 2big Thunderbolt 2 only has two drives, it doesn't really benefit from Thunderbolt 2's higher 20Gbps throughput capabilities. The drive is versatile with both Thunderbolt 2 and USB 3.0 connectivity options. A built in hardware RAID allows for RAID 0, 1, and JBOD for performance or security. The device performs well for having just two internal drives but don't expect Thunderbolt 2 speeds.